‌The University traces its beginnings to 1926 and the origins of the city of Coral Gables, a community marked by Mediterranean architecture and lush landscaping. When developer George E. Merrick made a gift of land and a cash endowment as the University's foundations, he envisioned an institution of higher learning that would embrace both American continents. A history of strong institutional leadership has enabled that vision to triumph: the University of Miami has established an international presence in medicine, engineering, law, the marine sciences, and other disciplines. Through these and a number of other innovative programs, the University has met the academic challenges of a student population representing all 50 states and more than 100 nations. At the same time, the University has addressed the needs of a diverse and vibrant South Florida community. The University of Miami, a privately supported, non-sectarian institution currently enrolls over 17,000 students in approximately 100 undergraduate, 95 masters, and 55 doctoral and professional areas of study. The graduate programs constitute 36 percent of all the University's students and 31 percent of all degrees it awards. Over 200,000 alumni reside in all 50 states as well as in over 154 foreign countries. University of Miami ranks No. 46 on U.S. News & World Report’s 2018 Best Colleges list and ranked No. 44 in the 2018 Wall Street Journal/Times Higher Education College Rankings. 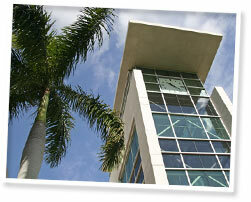 The University of Miami is accredited by the Southern Association of Colleges and Schools. It is a member of the American Association of University Women, the American Council on Education, the American Council of Learned Societies, the Association of American Colleges, the Florida Association of Colleges and Universities, and the National Association of Independent Colleges and Universities. Four UM campuses incorporate 200 university-owned buildings totaling approximately 11.8 million square feet on over 500 acres of land. Coral Gables: The Coral Gables campus, which comprises two colleges and seven schools, is located on a 239-acre tract in suburban Coral Gables. It has 118 buildings occupying 4.64 million square feet. Medical Campus: The University's medical campus consists of 72 acres within a 153-acre University of Miami/Jackson Memorial Medical Center complex. Other facilities at the medical center complex, in addition to Jackson Memorial Hospital, include the Veteran Affairs Medical Center, the Diabetes Research Institute, the Ryder Trauma Center, and two University-owned hospitals--the University of Miami Hospital and Clinics/Sylvester Comprehensive Cancer Center and the Bascom Palmer Eye Institute/Anne Bates Leach Eye Hospital. Rosenstiel School Campus: The Rosenstiel School of Marine and Atmospheric Science is located on a 8-acre waterfront campus on Virginia Key in Biscayne Bay. Its 16 buildings occupy 270,000 square feet. Other Facilities: The City of Miami/University of Miami James L. Knight International Conference Center adjoining the 615-room Hyatt Regency Hotel in downtown Miami houses a 5,000-seat convention hall, two auditoriums, and 16 classrooms. The John J. Koubek Memorial Center located near the heart of Little Havana in Miami includes the historic Koubek mansion (which has a classroom facility) and a 180-seat auditorium. The University owns a total of five buildings, occupying 74,900 square feet, at locations other than the four campuses.